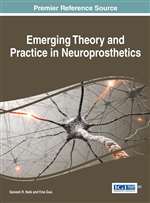 In this chapter, a practical artifact removal Brain-Computer Interface (BCI) system for single-trial Electroencephalogram (EEG) data is proposed for applications in neuroprosthetics. Independent Component Analysis (ICA) combined with the use of a correlation coefficient is proposed to remove the EOG artifacts automatically, which can further improve classification accuracy. The features are then extracted from wavelet transform data by means of the proposed modified fractal dimension. Finally, Support Vector Machine (SVM) is used for the classification. When compared with the results obtained without using the EOG signal elimination, the proposed BCI system achieves promising results that will be effectively applied in neuroprosthetics. The results of this study will provide an alternative communication channel for brain-computer interface (BCI) to transmit messages directly to computers by analyzing the brain’s mental activities (Blankertz et al., 2004; Hsu, 2010 & 2013; McFarland et al., 1997; Parra et al., 2002; Wolpaw et al., 2002). BCI systems based on single-trial electroencephalographic (EEG) signal analysis associated with finger movement or motor imagery have grown rapidly over the last decade (Parra et al., 2002). The advancements focus on discriminating real or imagined finger movements for EEG analysis using event-related brain potential (ERP). It shows that there are special characteristics for event-related desynchronization (ERD) and synchronization (ERS) in mu and beta rhythms over the sensorimotor cortices during mental tasks (Pfurtscheller & Lopes, 1999). Independent component analysis (ICA) is a statistical method that transforms observed multidimensional mixed signals into statistically independent components. It is a type of blind source separation that estimates the source components under the unknown knowledge of sources. Compared to principal component analysis (PCA), which only ensures that output patterns are uncorrelated, ICA makes certain of their statistical independence. It has been applied extensively to remove artifacts, such as electromyography (EMG) (Gao et al., 2010), for the analysis of EEG. The blind source separation can show neurophysiolgically and neuroanatomically meaningful neuronal components without the assumption of prior physic models (Hsu, 2011). In this chapter, an automatic method is proposed to eliminate the electrooculography (EOG) signals by means of the ICA algorithm (Hyvarinen et al., 2001) and correlation coefficient. Feature extraction is a very important issue because it greatly affects recognition rate, and several kinds of feature extraction methods have been proposed. Among them, band power and AAR parameters are more popular (Obermaier et al., 2001; Hsu, 2011). Feature extraction based on band power estimation is usually obtained by computing their power for several bands that are predominately involved in mental tasks. The estimated band powers are then computed with their logarithm values as descriptive parameters for every channel, or estimated by averaging over them (Obermaier et al., 2001). AAR models are also common in the feature extraction of mental tasks (Hsu, 2011). The all-pole AAR model lends itself well to modeling EEG signals as filtered white noise with certain preferred energy bands, and the EEG time series is fitted with an AAR model. In this chapter, modified fractal dimension (Hsu et al., 2007) together with discrete wavelet transform (DWT) is utilized for feature extraction. EEG signals are transferred to multi-scale data by using the DWT and MFFVs are then extracted via modified fractal dimension. The DWT is a powerful tool for transforming features to the time-scale domain, and it is an efficient and structured approach for ERP representation (Demiralp et al., 1999; Hsu et al., 2007; Hsu, 2012); modified fractal dimension in turn is advantageous in providing accurate and important fractal information. Support vector machine (SVM) (Boser et al., 1992), which recognizes the patterns into two categories from a set of data, is usually used for the analyses of classification and regression. For instance, it is applied to improve the diagnosis of Alzheimer's patients (Trambaiolli et al., 2011) and it can balance accuracy and generalization simultaneously (Boser et al., 1992), as such, it is used for classification in this chapter.